1. UN Secretary-General on the "Greatest Danger"
On 28 November, UN Secretary-General Kofi Annan gave a major policy speech at Princeton University in the United States. In possibly his final major speech before retiring from the UN, Annan listed some of the major threats confronting humankind that require collective and comprehensive action. These include economic and social threats (poverty, environmental degradation and infectious disease), conflicts between and within States, and terrorism. 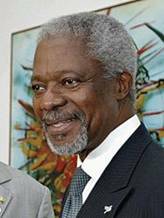 Annan criticized countries for talking this issue selectively and from two polarized paths. One of these is promoted by the ‘non-proliferation first’ advocates (including the Nuclear Weapon possessing States) who take no action on their own stockpiles but attempt to prevent anyone else from acquiring nuclear weapons. The other path pursued by the ‘disarmament first’ advocates who are hesitant to support stronger non-proliferation measures while the NWS make no progress on disarmament. Senator Emeritus Douglas Roche (Chair of the PNND Global Council) and Jonathan Granoff (Member of the PNND Global Council) were active in the summit as representatives of Nobel Peace Laureate organizations Pugwash and the International Peace Bureau. PNND Chair Senator Douglas Roche at the Nobel Peace Laureates Summit with former South African President De Klerk and IPB President Tomas Magnusson. The Summit also adopted a Charter for a World Without Violence, which outlined a practical and achievable program for nonviolently resolving conflicts, preventing aggression, overcoming oppression and achieving justice at inter-personal, community, national and international levels. The Charter for a World Without Violence and the Call for Nuclear Abolition are extremely useful documents that parliamentarians can use to help promote nuclear disarmament and peace. Previous declarations from the Nobel Peace Summits have been tabled (submitted for the record) in various legislatures including the US Congress. Nobel Peace Summit organizers hope that these two documents will find even more resonance internationally. Due to changed circumstances, PNND had to cancel an international parliamentary roundtable on Options and Possibilities for Denuclearization in North-East Asia, which was to have been held in the Japanese Parliament on December 6. PNND will re-schedule this roundtable for a future date.